Mountain biking can be described as the sport of riding bicycles off-road, often over rough terrain, using specially designed mountain bikes. 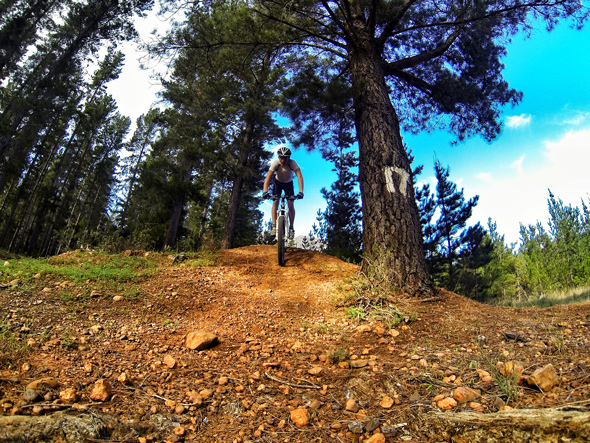 There are many different categories to the sport of mountain biking. 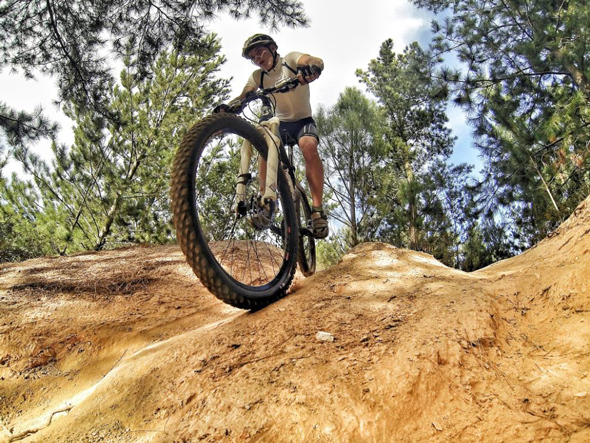 These include cross country (XC), trail riding, all mountain, downhill, free-ride, slope style, dirt jumping and trials. 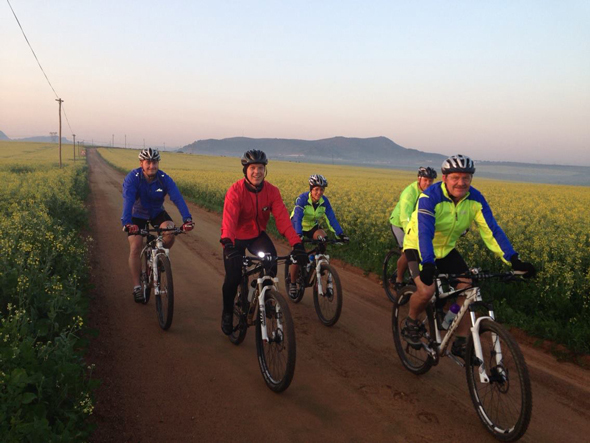 Most participants will take part in the cross country and trail riding categories. Mountain bikes share similarities with other bikes, but incorporate features designed to enhance durability and performance in rough terrain. The sport requires endurance, core strength and balance, bike handling skills, and a large degree of self-reliance from participants. Those who participate in mountain biking are usually a friendly, yet competitive and environmentally friendly group of guys and girls. 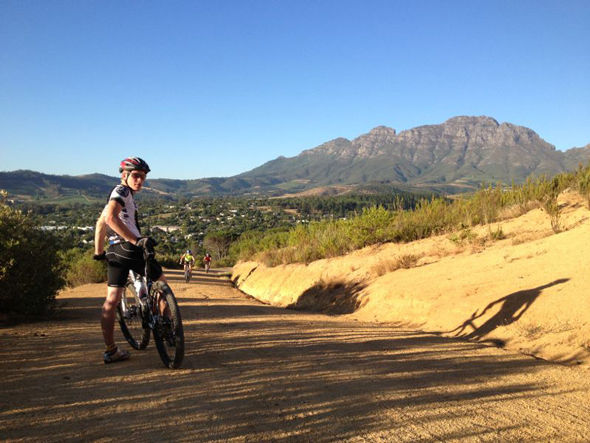 Mountain biking is a highly enjoyable activity for those who enjoy physically fitness – yet, it can also be one of the more dangerous sporting activities if not approached with the necessary caution and preparation. It is essential for just about any mountain biking fan to understand the fundamentals of mountain biking safety. 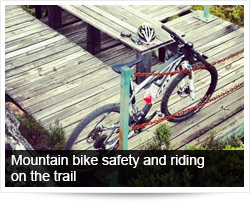 The experts in mountain biking are well aware of the risks and have shared important safety advice with us. Be aware of the weather. Check the latest reports and determine how the weather will affect the trail. There is strength in numbers - Don't ride alone, particularly in remote areas. In case someone is injured, it's best to be with at least two other people, one to get help and one to care for the injured rider. Fellow riders will also help to protect against possible criminality and bike-jacking. Always study a map of the trail before you go riding, know the possible challenges and how long your trip might be - don't get caught unprepared for a steep incline, tricky terrain or darkness. Know where you are and where you're going – inform friends or family where you will be riding and when you expect to return. Plan a ride to finish before nightfall just in case you have bike problems or you go a little off route. Plan exit routes as well, so if there are problems at any of the stages of your trip, you are able to confidently decide the quickest and safest way to services that you need. If it is a new trail it is more important to take a map, compass and / or GPS unit. If the weather changes, things can look very different in the fog or rain. Plan for a worst case scenario - always carry a mobile phone or another type of communication device for emergencies. Make a note of the relevant telephone numbers for emergency services. Check that batteries are charged or that you have spare batteries. Be well prepared with enough food, water, and equipment to last in case of emergency. Keep the trail safe for others by letting those who maintain the trail and other riders know when conditions change or new hazards appear. Emergencies could leave you stranded on the trail, so carry a pack with a first aid kit, a light, spare bulbs and batteries, rain gear, a reflective blanket and your bike repair tools: a pump, wrench, Y-socket tool, multi-tool, Allen keys, tire levers, and spare tires and tubes. Know your body and your limitations – don’t try to push yourself beyond those limitations. Think about what you are attempting to do and trust those instincts. The consequences of trying to 'carry on' can be pretty severe especially where you are riding on trails far from civilization. Where a rider lacks the fitness required to ride a particular trail, they may become fatigued, putting themselves at an increased risk of having an accident. The novice biker should train in less difficult and dangerous situations or at lower speeds before committing to something more dangerous - stick to smooth, flat trails with few sharp turns or steep descents. Practice riding the bike in a variety of terrains, from wooded areas to hills. Don’t try tackling rocks, grass and sharp turns until you feel sure that you can keep your bike under control, no matter what's in front of you. Do not attempt too much at the first attempt - build up your endurance and increase your aerobic capacity so that you can tackle longer rides, and practice your skills slowly until you are more prepared. Intermediate riders will want a few added rocks, hills, narrow spots and switchbacks (zigzagged trails) to challenge them. Before trying these trails, you'll want to be in good aerobic shape and have at least a few technical skills. Let those who ride with you know how you are feeling - if you've taken a knock, are feeling weak or light headed or would simply like to stop for a bit. Weekend riders might need little more than the right gear, some practice and a good warm-up. Take at least 20 minutes beforehand to warm up. This increases blood flow to your muscles so that you're less likely to injure them. Stretch your muscles, especially the quadriceps, hamstrings, calves, lower back, neck and shoulders. Regular exercise can help firm the muscles you'll use for mountain biking and give you the aerobic endurance you'll need for long rides. Swim, hike and work out with weights to stay in top biking shape. To reduce the risk of accident and injury the mountain biker should choose to ride on a trail within his/her range of experience. Gain as much info as possible on the trail you will be riding – do not attempt to ride like a pro on a trail you are not familiar with! Read bike and outdoor magazines, mountain biking web sites and tourism guides that have information about trails you are interested in. Look for signs that indicate the skill level needed to ride a specific trail. Try to find a topographical map to help you plan your ride. Know how to read the map and select a scale which will give you the most detail. Speak to the locals who know the trail and can identify specific hazards. Always follow the signs and route markers, and get to know the trail well. Never push the limits on a trail you are not familiar with. You need to get to know the trail you are riding at slower speeds before you can ride it like the trails you're used to. Be aware of the laws in your area that govern where you can ride. 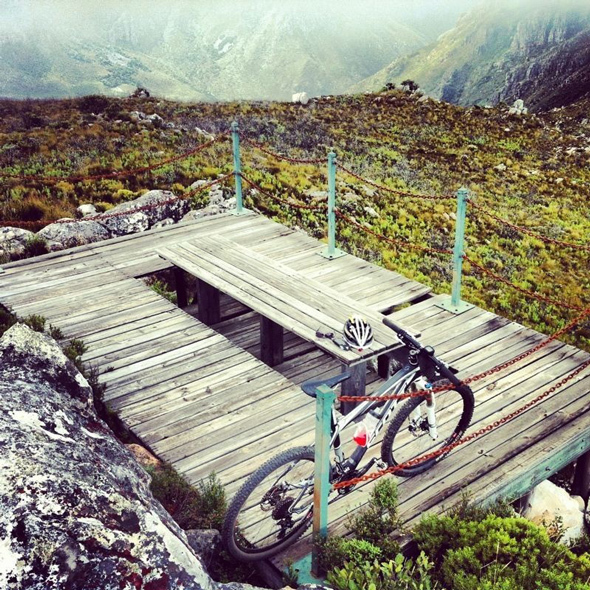 If the trail is not specifically for mountain biking, determine if you're allowed to bike there. Don't trespass on private land; do respect trail closures and get permission from the proper authorities if you are not sure cycling is legal on a particular trail. Speed on a trail you are not familiar with is essential - sustain your speed within a normal pace so that you can effortlessly adapt, going thru unpredicted hurdles or unexpected trail modifications and conditions. Yield the trail. When you get near another person, slow down. Let them know you're approaching and signal that you want to pass. Remember that there is no shame in walking sections you are not familiar/ comfortable with! Respect the trail and the inhabitants of the woods. Clean up any evidence of your presence. Any trash you bring with you should go back home with you or be disposed of properly. Watch out for animals. Never approach wild animals or startle them. Don't disturb animals and vegetation in any way - it's not only dangerous, it might be illegal as well. Before we consider the helmet and other pieces of protective clothing we need to have a closer look at the bike. There are a wide range of bikes from the easily affordable bike for the novice to very expensive bike for the professional, made from higher-quality materials such as premium-grade steel or aluminium, offering more accessories and abilities to fine-tune. From a safety perspective it is important that the bike needs to be the correct one for the rider, the type of riding to be undertaken and the typical terrain and angle of decent you will be riding. 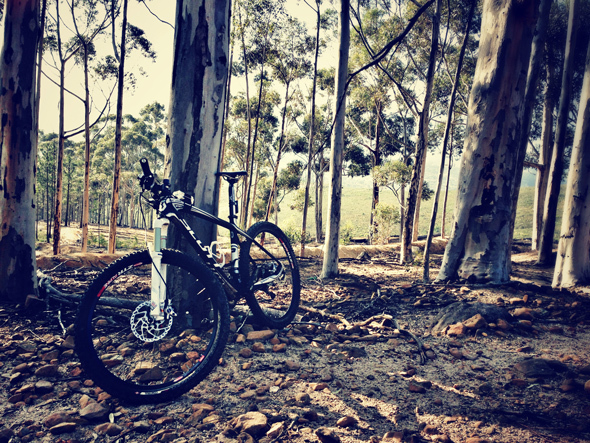 Mountain bikes were built to handle rough terrain. They're heavier than cross-country bikes, and can climb hills with ease. Trail mountain bikes are modified cross-country bikes with a softer suspension to handle bigger obstacles. Mountain bikes also come with two kinds of suspension, which protect the bike and rider from the shock of rough terrain. Full suspension bikes have both front and rear suspension. They're heavier, more comfortable and easier to control than hardtail bikes. Hardtail bikes have a front suspension fork, but no rear suspension. They are lighter and pedal more efficiently than full suspension, and they're more durable for off-road riding. Maintenance should be done more frequently than with a road bike - a mountain biker should check and properly maintain the bike before every ride. Mountain biking places higher demands on every part of the bike. Jumps and impacts can crack the frame or damage components or the tyre rims, and steep, fast descents can quickly wear out brake pads. Ensure brakes are adjusted properly to stop your bike while descending. Common problems are brake cable stretched, pads are worn, brakes knocked out of alignment with rims or discs. Inspect the bike frame for cracks and damaged or dented areas. Front and rear axles should be tight. Headset and stem must be secure with no looseness or play. Check that your tyres are in good condition, with no tears or cuts in the sidewall. Handlebars and handle grips must be tight and unable to spin. Seat and seat post need to be fastened securely. Regularly applying oil to the chain will help extend the life of the chain and chain set. It is important for the mountain biker to get to know his bike, understand when / which gears get him in trouble. Best advice - if you can't fix any problems yourself, take it to your local bike shop. Better to be safe than sorry! The mountain biker should be actively thinking and paying attention while riding to keep from getting hurt or possibly injuring others. The helmet is the important piece of equipment to protect his head and brain when riding! Make sure your cycle helmet fits properly - the helmet should be a tight fit so that the chinstrap is there only to stop it from coming off rather than holding it in place. The side straps on your helmet should form a V-shape around the ear with the adjuster just below the ear lobe. The front strap will keep the front of the helmet in place while the rear strap prevents the helmet from falling over your eyes. The rear strap should fit neatly just under the base of the skull, centred evenly with the tension from each of the side straps. Common mistakes are having one strap too loose, or completely messing up the fit either by pulling the back of the helmet down or pulling the rear strap over the ear. Before heading off, while talking to your mates, you should feel the helmet pull down a bit when your mouth is open - otherwise it is too loose. For safe mountain biking riders need protection from head to toe from the elements and hazards on the trail. For clothing, padded shorts, baggies or lycra will keep you more comfortable on long rides. Make sure the gear is the right size and you're wearing it properly. It is best to have layers of clothing available to you. Pack a waterproof jacket in case the weather changes and a reflective jersey if you're going to be riding at night. Knee and elbow pads will help shield you against scrapes and falls, and gloves will keep your hands warm and protect against knocks and falls or blisters when you grip the handlebars. For extreme downhill rides you need a full face helmet, relevant limb protection and suitable back and torso protection. If you have clipless pedals, get the right shoes that fit into your pedals' cleats. They should be comfortable, durable and have a hard sole to help you pedal more efficiently. Wear thick cycling socks to prevent blisters. A good pair of sunglasses will protect your eyes from the sun's ultraviolet rays, and keep out dirt, wind, bugs and branches. Choose shatterproof lenses with high UV protection. For longer cross-country trails remember to pack food and water for energy and hydration. Pack a snack, such as an energy bar or piece of fruit, to keep you going. Water is a must-have to protect from dehydration. If you don't want to continually pick up a bottle while you ride, get a backpack-mounted system. The mountain bike rider should always ride in control and within his abilities. There is a fine line between pushing the limits safely and pushing them recklessly. Safe mountain biking comes with experience – even though we cannot provide a guide to all the techniques we would like to share some advice from professionals with our lesser experienced riders. Pay attention to the bike path, and steer away from obstacles accordingly. Keep your speed at a level that will allow you to adjust to any unforeseen obstacles or changes in trail conditions. The more control you have over your speed – the more control over your bike.  Avoid attempting crazy stunts on your mountain bike – think! Try to keep your pedalling motion constant and rhythmic. When nervous or uncomfortable on your bike, take some time to gain control. If you think a section is well beyond your skill level then get off your bike, take a look and only ride it if you are confident that you can complete it with the minimal amount of risk to yourself and others. It is your responsibility to avoid other persons and objects around you. Do not stop where you obstruct a trail or are not visible from above. When entering a trail or starting downhill, you must look uphill and yield to other riders. Learn how to distribute your weight evenly across the bike whilst feeding power to the right areas of the bike. It takes practice to learn how simple variations in forward and backwards movements of your body can help you get over obstacles and up steep hills. Drop your elbows and keep them close to your side, lowering the centre of gravity - as you become more expert you can start to shift your weight slightly further forward which should additionally help with the front wheel lifting. Keep your head up to pick your line - you should see the obstacle and focus your attention immediately on the best route around it. Keep your focus on this point of reference and you will usually successfully navigate tricky obstacles. Get in the right gear - when approaching a hill a common problem is to flick into the lowest gear and attack the hill. Instead, select the gear that's just low enough that doesn't mean you have to stand on the pedals. This can be an exhilarating, adrenaline pumping ride but also very dangerous. You should always check that your brakes are in the best working order before attempting an extreme downhill ride! Keep your legs and arms relaxed and flexible - even though you may be riding a full suspension downhill mountain bike, your arms and legs are the most effective shock absorbers you have, and flexibility in your legs is key when riding over humps and bumps. When riding over the bumps, get your weight back over the rear wheel, and either grip the saddle with your thighs, or place your belly on the saddle keeping your knees bent and relaxed. Your elbows should also be slightly bent. Keep your feet in line with the ground - unless negotiating sharp tight switchbacks or corners your feet should be in a 'platform' position at roughly 3 and 9 o'clock. If you start to loose control it's easy for you to just jump off the back of the bike. Trying to dismount over the top of the bike is not always the most practical on the steep stuff. Brake evenly using both the front and back brake. Pick a line and stick to it - as you descend, look ahead 15 to 20 feet. The route you choose and your brake control contribute to a fluid descent as well. Set Your Light Right - the ideal light setup combines a helmet-mounted spotlight and a bar-mounted unit with a broad-coverage beam. Look where you want to go - your light, like your bike, is going to follow your eyes, so look ahead, not down. "Your helmet light should be aimed at least eight feet ahead". Artificial light sources create shadows that skew your perspective on obstacles. Two keys to success in technical situations: knowing about the weird shadows, and saving your highest light-output setting for when things get rough. Novice riders should stick to a trail they know like the back of their hands so they can test their night vision on known obstacles and corners. How easy would it be to receive medical treatment or to be evacuated from where you are riding? Keep in mind that helicopters cannot fly in low visibility and may not be able to fly out to rescue you in the event of an accident. In bad weather, you should take fewer risks and try to stay near to a 4×4 track where the emergency services can get a vehicle to you. Injuries tend to range from minor wounds, such as cuts and abrasions from falls on gravel, to major injuries such as broken bones, head or spinal injuries resulting from impacts with rocks, trees or the terrain being ridden on. Even though it is not required of the mountain bikers to possess the knowledge and skills of a paramedics, a bit of first aid awareness can be of great help in an emergency situation! We would like to advise taking a first aid training course to learn how to treat a broader range of injuries. With this page we would like to pay tribute to the memory of Olympic cyclist Burry Stander and the inspiration he delivered to so many MTB enthusiasts! We would like to plead for greater safety and respect towards all cyclists from all cycling codes! May we share our public roads and mountain bike trails with the greatest of respect to all!